"It’s time we as a nation have a serious discussion about outlawing billionaires. This week we learned that 2012 was one heck of a year for the billionaires. The 100 richest people in the world got $241 billion wealthier this year bringing their total net worth to $1.9 trillion. These 100 people have more combined wealth than the entire GDP of nations like Italy, Mexico, Spain, Canada, Australia, and about 170 other nations. Billionaires exclusive to the United States also had a field day. As the annual Forbes 400 list of 2012 showed, America’s richest billionaires saw their wealth increase by $200 billion last year bringing their total net worth to $1.7 trillion. At the same time, the United States economy, which is staring down a year of impending austerity, is stagnating. Despite moderate employment and GDP growth, 49 million Americans are still in poverty. Also, 46 million Americans are on food stamps because they don’t have enough money to feed their families. The economic situation in Europe continues to deteriorate. And even emerging markets in Asia are slowing down. 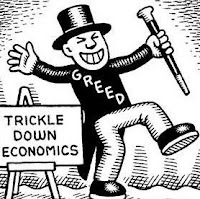 So if it were true that the world’s economies rely on their super-rich to do well, as today’s oligarch-inspired, right-wing economics argues, then why are world's "austerity" economies doing so poorly? It’s because billionaires are not job creators, they are somewhere between symbiotes and parasites. That’s not meant as a personal insult against billionaires, many of whom are decent people. But it’s meant as a statement of common sense. If vast fortunes are being hoarded in the hands of very few people who can’t possibly spend that much money in their lifetime or their kid’s lifetime or even their kid’s, kid’s, kid’s, kid’s, lifetime, then it’s essentially being wasted. If the 400 richest billionaires in America could generate just as much economy activity alone as the rest of us can, then maybe there'd be an argument for such vast wealth. But they can’t. The typical billionaire doesn’t buy thousands of more pairs of pants, or dine out thousands of more times, or buy thousands of more cars typical working class American. Wages are a key point. It’s no coincidence that the explosion of billionaires in America has corresponded with the flat-lining of workers’ wages. For most of American history, workers’ wages grew as their productivity grew. This was considered a law of economics. So much so that in 1966, TIME magazinepredicted a coming “Leisure Society” in which workers would benefit from increased productivity as a result of automation and technology, and see their wages increase despite working fewer and fewer hours. But right around the time that corporate leaders saw their income tax rates slashed drastically, and began looking overseas for cheaper and cheaper labor, a great rift opened up between productivity and workers’ wages. Productivity went up considerably, as TIME magazine predicted, but wages stayed flat. The Leisure Society never came to be. But the billionaire class did come into being, as corporate leaders sucked more and more wealth from their now far-more-productive workforce while refusing to share any of these gains with their workers or their community. After all, with new low personal income tax rates, there was a lot more incentive for executives to just keep the cash rather than pay their workers well. As a result, the typical hourly wage for an American worker increased a measly $1.23 over the last 36 years, after accounting for inflation. 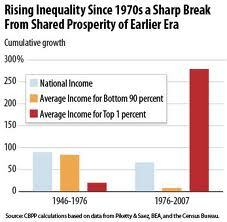 Meanwhile, the top 1% have seen their incomes increase by 275% since Reagan's election. Today, workers’ wages as a percentage of GDP are at an all-time low. Yet, corporate profits as a percentage of GDP is at an all-time high. Our most prominent Founding Father warned of the dangers of individuals becoming mind-bogglingly rich. In a letter to Joseph Milligan on April 6, 1816, Thomas Jefferson explicitly suggested that if individuals became so rich that their wealth could influence or challenge government, then their wealth should be decreased upon their death. He wrote, "If the overgrown wealth of an individual be deemed dangerous to the State, the best corrective is the law of equal inheritance to all in equal degree..."
Also in 1816, Jefferson wrote a letter to Samuel Kerchival explicitly laying out the dangers of an entrenched aristocracy, as today’s billionaire class has now become. Jefferson wrote, “Those seeking profits, were they given total freedom, would not be the ones to trust to keep government pure and our rights secure. Indeed, it has always been those seeking wealth who were the source of corruption in government. No other depositories of power have ever yet been found, which did not end in converting to their own profit the earnings of those committed to their charge." 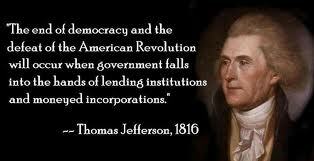 But Jefferson’s warnings were ignored. 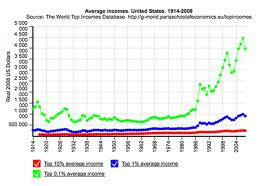 And now, with the top 1% of Americans owning more wealth than a third of the entire nation, and the bottom 50% of Americans only owning 3% of the nation’s wealth, we as a nation are facing inequality levels not seen at any time in American history. This is the price we as a nation are paying for letting billionaire-funded think-tanks and lobbyists convince us - and Congress - to move to low tax rates, free trade policies, and deregulation (particularly of the financial industry). This defies both history, logic, and sanity. It’s time to put in place a new wealth tax in America. I propose a 100% tax on all wealth over one billion dollars. If you can’t get by on a thousand million dollars, then you probably shouldn’t have access to that much money in the first place. There's nobody who can't make it on a billion dollars. So, any wealth over a billion dollars, a hundred percent of it goes to help the rest of the country have a decent life. That money can lift 49 million Americans out of poverty and move the 46 million Americans on food stamps into the middle class. They will - by the "invisible hand" of human instinct and need - better know how to spend the money and generate economic activity than the billionaire class, which currently has its excess trillions stashed in off-shore bank accounts. This wealth tax would also break up giant monopolies and open up the market for small businesses. We shouldn’t rely just on the Bain Capitals and the Koch brothers to start or buy up new businesses. If the riches of the billionaire class were redistributed (a word progressives should embrace), then more and more Americans could have access to startup capital and earn a living as entrepreneurs. Trust me, the billionaires can spare it. The total wealth of the average American family is $57,000. Convert that into hundred-dollar bills, and it’s a stack about 2 inches tall. The one-percenters, at an income of around $300,000 a year, earn a stack every year that's about a foot high. 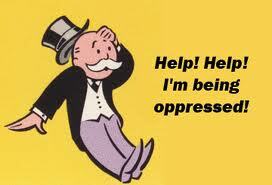 But the average wealth of the billionaires on the Forbes 400 list is $4.2 billion. Convert that into a stack of hundred-dollar bills and it would reach over two miles into the sky. It would be a navigation risk to aircraft. It’s time to start funneling the riches produced by the American economy to the real job creators: working class people who are spending money. 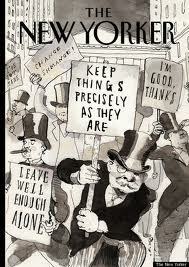 And the best way to do that is to outlaw billionaires with a 100% wealth tax on all assets over one billion dollars. We can call it the “No Billionaires Campaign,” and it just might be our best hope to save the American middle class." For those sheeplets seeking a quick, encyclopediac rundown of Communism and Socialism, see --> http://en.wikipedia.org/wiki/Communism and http://en.wikipedia.org/wiki/Socialism. And to help with some more educational entries in Wikipedia --> http://en.wikipedia.org/wiki/Social_equality, http://en.wikipedia.org/wiki/Egalitarianism, http://en.wikipedia.org/wiki/Class_conflict, and most especially http://en.wikipedia.org/wiki/Causes_of_the_Great_Depression#Disparities_in_wealth_and_income. Then, of course, we direct you to http://www.criminalizeconservatism.com/ AND https://www.facebook.com/CriminalizeConservatism?ref=hl.